Thursday, 9 April, 2009 – Nick. I’ve previously joked with Jim, Minh, and Tone that if we ever start a company, we should call it “Jinh & Tonic”. I reckon it’s classy. Tone reckons it’s “kinda gay”. I don’t like the term “kinda gay” since it implies a negative value judgement on homosexuality… and now I’ve just made this post a little too serious. It’s like TortoiseSVN for Linux! 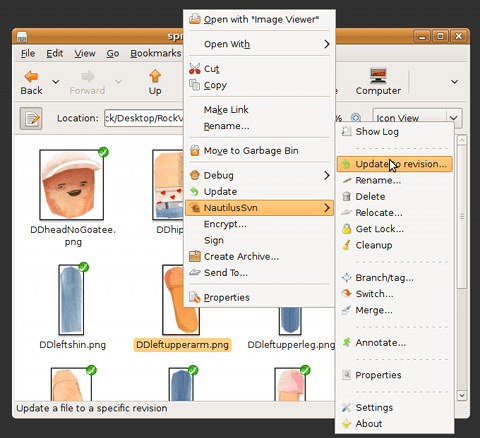 NautilusSvn is a Python extension for Nautilus which integrates a load of Subversion functionality into the GNOME Nautilus file manager, basically as a clone of the TortoiseSVN project on Windows. It’s only up to version 0.12, but it’s already very easy to download and install, featured packed, and I haven’t experienced any issues. Author NickPosted on Thursday, 9 April, 2009 Thursday, 9 April, 2009 Categories General2 Comments on It’s like TortoiseSVN for Linux! A few friends of mine over at Teh Learning Curve have just released the first episode of their video game review show. Our pilot episode, needless to say it’s a little rough around the edges! At this stage we were just testing out our tech and some show ideas, but hopefully you will find the core concept of the show still intact and enjoyable. I like the format and hope to see their personal styles evolve more as the show goes on. I also want to see less short shorts; or at least shorts that are a different colour to the couch so that you are constantly reaffirmed that they are there! I think that Dan described the show as something like America’s Got Talent for video games. They have the funny guy, the harsh critic (although Dan could try on a British accent), but now they just need a pretty artist (sorry Scott…).